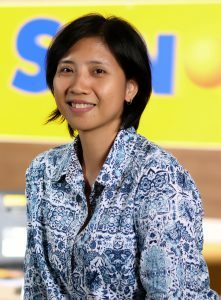 After getting her Mass Communication degree from the University of the Philippines Cebu, Campaña wrote Cebuano news and feature stories for Bantay Radyo. In 1997, after nearly six years in Bantay Radyo, she moved to SunStar Cebu, covering the Cebu City Government for 10 years as a reporter before becoming page editor, then news editor. As a City Hall reporter, she exposed lapses in local governance, including the failure of Cebu City Hall disbursing officer Rosalina Badana to account for P18.5 million in cash advances intended for the salaries of City Government employees in March 1998. On July 3, 2001, Campaña was among the SunStar Cebu reporters banned by Cebu City Mayor Tomas Osmeña from his press conferences, after the mayor accused SunStar Cebu of working as a propaganda machine for his opponent and former ally, Alvin Garcia, in the May 2001 elections. He also banned reporters of radio dyHP for the same reason. The City Hall Association of Reporters in Media wore black ribbons to protest the move; the Cebu Federation of Beat Journalists passed a resolution condemning it. Osmeña lifted the ban on Sept. 4, 2001. Campaña also contributed articles to the Cebu Journalism and Journalists magazine. She is remembered as a low-profile but dedicated journalist who, as a mentor, brought out the best in reporters with her endless capacity for encouragement and affection.